* GIPS is a registered trademark of CFA Institute. CFA Institute has not been involved in the preparation or review of this report/advertisement. Learn more. 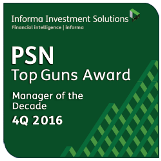 We are pleased to announce that our Fully Invested Value Equity strategy achieved Top Guns Manager of the Decade status in the Global Equity Universe for the period ending December 31, 2016. We seek to reduce risk while pursuing attractive growth and preservation of capital. Our decades of experience and contrarian mindset enable us to buy stocks near the point of maximum opportunity—typically when a stock is very out of favor. We are steadfast in our commitment to the needs and goals of our clients.